Recently the voters of France and Greece went to the polls. In both countries they sent an obvious message that they wanted change of two kinds: New political leaders, plus something other than the focus on austerity that has dominated recent efforts to keep the European Union intact. Strategists for President Obama and Governor Romney are no doubt busy digesting the European elections for their presidential campaign implications, but it would be a major mistake to stop at that obvious message. The candidate who sees the other, powerful, hidden message may just win the White House because of it. It goes back to the psychologist Abraham Maslow. 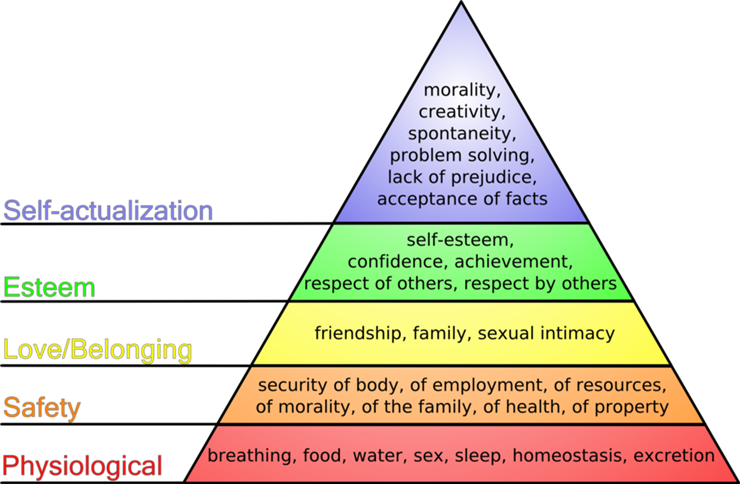 In 1943 he created what's become known as the "Hierarchy of Needs." His point was that people will focus on the lower, more fundamental needs before they spend much time on the higher ones. Lots of key topics in the presidential campaign center around one item or another in that lower, more fundamental level of "Safety" on this pyramid. For instance, the debates on job-creation, gay-marriage, and Obamacare are so powerful because they resonate with us at a pretty basic level. •	Safety of property. Debt collectors have created an epidemic of lawsuits aimed at winning judgments against consumers who didn't know they were being sued, or were too scared to appear in court. In effect they take unsecured credit-card debt and convert it into an asset such that the court system becomes an arm of the debt collectors by seizing property and jailing consumers over that debt. •	Safety of the family. Sometimes it's a kid who picks up the phone and is told to kiss her daddy goodbye, because he's going to jail. Other times it's a threat to pay up or a relative will go to jail. •	Security of body. Consumers are regularly threatened with bodily harm by debt collectors. •	Safety of employment. A favorite tactic of dishonest collectors is to call a person's office and make it known far and wide that he's a deadbeat, his wages may be garnished, and so on. Is any one consumer be the target of all these assaults on basic human needs for safety? Unlikely. But because these are often-used tools, consumers who don't comply after one tool is tried will then be worked over with another one. Which gets us back to the European voters. Analysts on TV have been scratching their heads and saying: "Don't these voters know that their economies are in serious trouble, and they can't afford to blow off reforms? Don't they know that the only 'no confidence' vote that counts is the bond market's, and if that happens, all hell will break loose?" Yes, most of these did read the papers or watched TV and were aware of all that before they cast their votes. But they channeled James Carville, who helped Bill Clinton get elected with the phrase, "It's the economy, stupid." The Europeans took that concept one step further by proclaiming in effect, "It's MY economy, stupid!" First things first. In our world of micro-payments, micro-climates, and micro-electronics, it's our micro-economy that preoccupies our thinking long before national economies do. And when my micro-economy is assaulted in the most vulgar, direct, and unrelenting fashion by debt collectors, my top three issues when casting my vote will be, in this order: 1. Get the phone to stop ringing; 2. Get the phone to stop ringing; and 3. Get the damn phone to stop ringing. 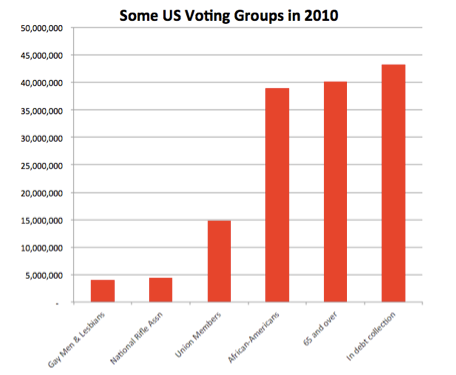 Big voting bloc in big pain = big opportunity for the candidate who first acknowledges this group publicly. But there's a catch: With certain campaign issues it's enough to talk about what the proposal will accomplish months or years from now, like investment in clean-energy technology or stem-cell research. With this mega-voting-bloc, they're in enormous pain right now. It will not be good enough to "feel their pain." Instead, the candidate must make the perpetrators feel serious pain. Only when their pain far exceeds the profit potential of abusing consumers will their own hierarchy of needs announce it's time to back off. This group of voters is low-hanging fruit that's ready to be picked by the candidate smart enough to see the hidden message.